Random samples, the null hypothesis and bell curves are but distant concepts learned taking statistics in a college class long ago. Yet, statistics are used daily, and one cannot escape using or being a part of a statistic. Without knowing how well you performed [statistically] it is difficult to forecast any future event. For example, your favorite baseball team has the lead at the bottom of the 9th inning. The coach signals the bullpen to send in the “closer.” Why? Based on statistics, the closer is proven to be effective in getting the remaining outs to win the game. So what do statistics and baseball have to do with inoLECT? Many of our readers are customers of inoLECT and take advantage of the many products and services we provide, including the inoRAC Remote Racking device. Numerous customers have seen an inoRAC demonstration and agree it is a well-engineered product beneficial in removing personnel from hazards and protecting equipment. Yet, many have not purchased the inoRAC, or any other device, as they do not see any issue for their particular plant. “We’ve been doing it like this for 20 years without any incident” or “we never perform work, unless we have a dead bus” are some of the statements commonly heard when considering safety equipment in a plant. Perhaps statistics do not concern them? Perhaps they think electrical safety is just nonsense born from safety directors with nothing better to do? Perhaps they believe they are in no danger of being the next plot on a bell curve? Consider this: The Bureau of Labor Statistics reports that electrocution is the fifth leading cause of work place fatalities in the US. Electrical Safety Foundation International reports that every 30 minutes during the work day, a worker suffers an electrically induced injury that requires time off the job for recovery. Over the last ten years, more than 45,000 workers have been injured from on-the-job electrical hazards. OSHA reports that 80% of electrically related accidents and fatalities involving “Qualified Workers” are caused by arc flash / arc blast. Between 2007 and 2011, more than 2,880 fines were assessed for not meeting OSHA regulation 1910.132(d) which averages out to 1.5 fines a day. 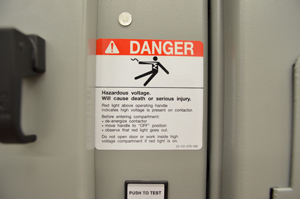 97% of electricians have been shocked or injured on the job. These are merely just statistics. They really don’t matter, do they? Arc Flash is the sudden release of electrical energy through the air following a phase-to-phase or phase-to-ground fault. The resulting force produced is known as the Arc Blast. The core of the arc flash can reach temperatures of 35,000℉ (19427℃) in less than 1/1000th of a second, which is four times the temperature of the sun’s surface. The intense heat turns copper instantly into a plasma state making it expand 67,000 times its solid-state size. The quick expansion of copper causes a pressure wave measured at thousands of pounds, which propels shrapnel, nuts, bolts and debris at speeds up to 700 miles per hour. The light flash produced is intense enough to damage human sight. The sound wave can exceed 165 dB causing permanent hearing damage. The paradigm of yesterday is truth today and the dangers of arc flash are violent and real. It is imperative that each facility review and regard steps to prevent electrical hazards as a serious matter when presented with statistical data. There are many factors when considering adding safety equipment, such as the inoRAC Remote Racking device. However, the absence of a decision is a decision that is costly. Statistics and facts are two issues that cannot be eluded. It’s the bottom of the 9th inning. Are you ready to send in the closer? Statistically, the inoRAC will help get the win.